The Babe Ruth Baseball / Softball program, using regulation competitive baseball and softball rules, teaches skills, mental and physical development, a respect for the rules of the game, and basic ideals of sportsmanship and fair play. In all aspects, Babe Ruth League, Inc. is committed to providing our participants the very best educational, sports experience possible. It is our fundamental belief that every child with a desire to play baseball or softball be afforded that opportunity. Above all else, Babe Ruth League, Inc. PUTS KIDS FIRST. Babe Ruth is an educational program using the playing of the game of baseball as an opportunity to identify and teach sportsmanship, fair play, and to promote the physical and mental development of each player. In adopting rules, in establishing standards, and in ALL planning, our primary consideration is what’s best for our youth. 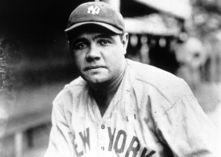 Click on the Babe Ruth logo below to go the official Babe Ruth League website. © Pacific Northwest Babe Ruth. All rights reserved.